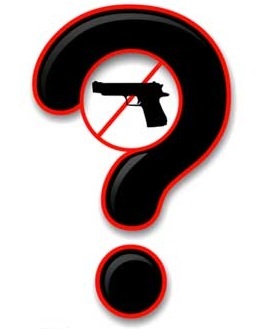 Is Carrying a Concealed Weapon the Answer? It seems this debate continues to have a life of its own-- The right to carry a concealed weapon and should it be regulated on the state or local level. Like everyone else, I have an opinion. Chances are it might be misunderstood by most people. Hopefully not. A friend shared an old "surveillance" video of a customer turning the tables on two criminals. It is meant to support the right to carry, and I guess it does in a way. But, to me, it also proves another point. The following video is not the exact one my friend shared, but it's just one more copy of the same incident. Okay-- I get it. I do! Sometimes I agree. Sometimes I don't. But, here's my thing about this video. How close do you actually have to be to someone to NOT miss? Seriously? There are many people who have or want a carry permit, but they can't shoot worth a poop. Yep, poop. I don't trust many in a certain age group to drive. Why would I trust that they can carefully and effectively aim and shoot at an offender? I don't unless they are in excellent mental and physical condition. Like I said, I get it. I really do. And, I see both sides. Sometimes, I think being able to lawfully carry a concealed weapon could deter some crime IF criminals knew random people might be carrying at any random moment. But (and this is a big but), many seniors can't even tell what color the traffic light is, or don't care. Many are shaky, unsteady, and on a thousand meds. I don't want them aiming at ANYTHING anywhere near my daughter or me. From what I saw, dude didn't hit one guy, and he was right there!!! He was so close he could have kissed him. He shot through the door, and a kid or any bystander could have been hurt. That's just reckless. Period. Can you say training? A REAL, ACTUAL, REQUIRED, BEYOND STRICT training which also includes a mandatory mental examination! You don't pass, you don't carry! You don't re-certify, you don't carry! There are too many hotheads out there (young, old and between) who just want to walk around with a gun all Rambo-ish and over-confident, while lacking responsibility and maturity. Yeah, it is or should be their right, but I have the right to not die because of some moron. More likely than not, turning this country into a yeah-carry-a-concealed-weapon society is just going to get more innocent people killed in the long run. And the guy in this video could have been a prime example of that. Let's not forget a young father who lost his life in a theater because of another senior citizen who is just an over-entitled hot head. Because, yeah - If you send a text message during a movie, you should be executed. Another example is the young black male who was shot and killed at a gas station because his music was too loud. Yep. Oh, and the Stand Your Ground Law that has entitled certain citizens to stand on high moral ground, go looking for trouble, then claim self-defense. This isn't about senior citizens. I just used that example because of the video. This is about all untrained and uninformed people who think they have the right to put my family in danger. Get educated. Get trained. Get certified. Then, I'm cool. Power without responsibility or consequences. Isn't freedom grand. I believe most people who want this have good intentions, and just want to protect themselves and the ones they love. I own a gun, and I would be one of those. But, the other group... Yikes! God protect us all! Yeah, that's certainly a mouthful. However, my point is that there are too many crazy people in this world. People who would fly off the handle at any moment, and start shooting because someone offended them in some way, or didn't give them the "respect" they deserved. For the record, I'm not talking about the obvious nuts. I'm talking about the "normal-looking" nuts. The ones in suits. The ex-cops and ex-chiefs of police. The bankers. The teachers. The managers of fast-food restaurants. The office workers. The average, hardworking, everyday Joe. Not to mention those in high income brackets who believe everyone else is beneath them. And no, not all. Just those that fit snugly. Did I forget the right to carry a concealed weapon in our parks? What? Wait. What? Seriously? Yeah, that's what I want. I want my child to be on a merry-go-round while some having-a-bad-day creep walks around her with a hidden gun. It's bad enough I have to constantly watch for pedophiles. I mean, the parks are one of their favorite places. Now, I have to watch out for gun-toting maniacs who are ticked off because someone parked crooked. We can see the typical thugs coming. We can't see these people coming, and they are the ones shooting people because of loud music, text messages, and dirty looks. The entitled ones. The ones that believe rules of conduct are meant for everyone else. Yes, many criminals walk around threatening people with guns and other weapons, but is arming the rest of society really the answer? Maybe. But not without EXTENSIVE weapons training, ongoing education, at least yearly re-certifications, and a psychological examinations. Yeah, I said it. I don't need any well-dressed, self-entitled psychopaths endangering me and mine. Would I want to defend my daughter and myself? Absolutely! But, I'm trained and have properly used a weapon my entire adult life. How about you? That's what's on my desk. Thanks for reading! Without even getting into the right to carry argument, I always told my ex-husband we could NEVER have a gun in the house - because if we had I would have used it. It would have been far too easy, and he would have been a dead man. And I am not a violent person by nature. Look at the "stand your ground" crap comiing out of Florida! Guns are DEADLY weapons, and while I believe in a right to defend yourself and your loved ones, I don't believe those rights are being exercised properly as the laws currently stand now. I wish someone could go back in time and make it so guns were never invented at all. Very true! It is always too easy to just pull out a gun and shoot, and that's why I have such an issue with the whole thing. It's sad to say, but most people in strange or even threatening situations aren't thinkers. Like I said-- hotheads. I completely agree about the Stand Your Ground law. I am especially irritated about the case of the black woman that "held her ground", but fired a warning shot to get her ex-boyfriend/husband to leave her alone. She shot no one, yet she is in prison because she fired a warning shot. Officials are now considering amending that law so that people can fire a warning shot, but if they do, she will spend over 60 years in prison instead of 40 (or whatever it is. I can't recall this second). I don't understand that at all. She gets MORE punishment for NOT killing and firing a warning shot when others will be allowed to do that exact thing legally. I'm truly hoping the news reports were wrong on that count. When she was convicted, they said she would have gone free if she had shot the bum. UGH! I've had opportunities to shoot, and didn't because of the situation in that exact moment in time. But, there have been situations that if I had had my gun at that time, I would have fired because it would have been necessary to save myself, and it would have been justified. Unfortunately, in some states (not Florida) it's all about timing. Thanks so much for commenting, A.B.